There is no doubt that behavioral economics is becoming a dominant lens through which we think about economics. Behavioral economics is not a single school of thought but representative of a range of approaches, and uniquely, this volume presents an overview of them. The wide spectrum of international contributors each provides an exploration of a central approach, aspect or topic in behavorial economics. Taken together, the whole volume provides a comprehensive overview of the subject which considers both key developments and future possibilities. Part One presents several different approaches to behavioural economics, including George Katona, Ken Boulding, Harvey Leibenstein, Vernon Smith, Herbert Simon, Gerd Gigerenzer, Daniel Kahneman, and Richard Thaler. This section looks at the origins and development of behavioral economics and compares and contrasts the work of these scholars who have been so influential in making this area so prominent. Part Two presents applications of behavioural economics including nudging; heuristics; emotions and morality; behavioural political economy, education, and economic innovation. 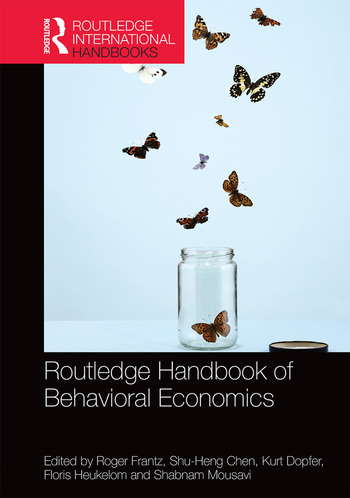 The Routledge Handbook of Behavioral Economics is ideal for advanced economics students and faculty who are looking for a complete state-of-the-art overview of this dynamic field. Roger Frantz is Professor of Economics at San Diego State University, USA. Shu-Heng Chen is Professor at the Department of Economics at National Chengchi University, Taiwan. Kurt Dopfer is Professor at the Department of Economics, University of St. Gallen, Switzerland. Floris Heukelom is Assistant Professor at Nijmegen School of Management, Radboud University Nijmegen, the Netherlands. Shabnam Mousavi is Assistant Professor at the Johns Hopkins Carey Business School, Johns Hopkins University, USA.